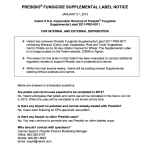 Valent has removed the Presidio® Fungicide Supplemental Label containing Brassica (Cole) Leafy Vegetables, Root and Tuber Vegetables, Carrot, Potato, and a 30-day rotation interval for Wheat. The reason is that Valent has been requested to conduct additional studies to support Presidio use in potatoes and carrots. Valent will reissue a revised Supplemental label that will contain the use on Brassica (Cole) Leafy Vegetables and a 30-day rotation interval for Wheat. Please see the attached label notice for details. Carrot and potato uses are expected to be reinstated in the future; when is not known, but not in 2013. There is no impact on carrots or potatoes already treated with Presidio. Presidio may continue to be used on other labeled crops.